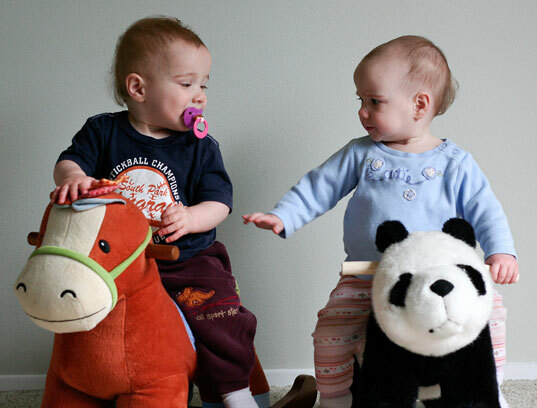 Whether in the form of a traditional horse or an animal out of Africa, kids love rocking toys. And since they help toddlers hone their coordination and balance skills, they're a great addition to the playroom. Skip the plastic chunky versions and choose an elegantly designed green option instead. Here are seven of our favorite sustainable rocking toys, all of which have heirloom potential. Hang on, we're going for a ride! 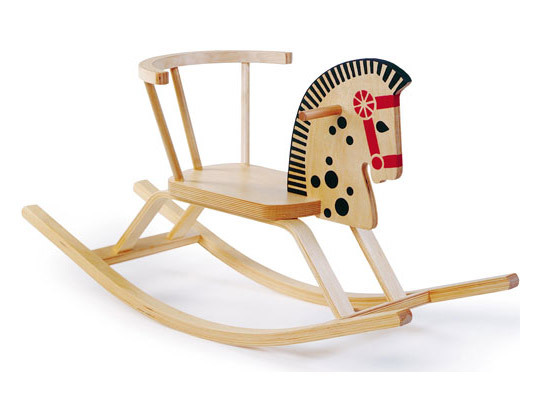 Rocking chair meets rocking horse in this best-of-both-worlds design from modern furniture maker Offi. The Baltic Rocking Horse Chair is made from Forest Stewardship Council-certified birch ply and the tried-and-true design has been in production for more than half a century in Europe. Step out of the rocking horse box and go for a handcrafted Giraffe Rocking Chair to spark your little one’s imagination. Recycle Studio uses over 90% recycled materials including plywood leftover from making daycare furniture. For no additional cost you can personalize this rocker with your child’s name. Another animal rocker inspired by an African safari, this Walking Elephant from Plan Toys provides a unique riding motion. Powered by your child’s movement of rocking back and forth, the toy impressively walks forward. 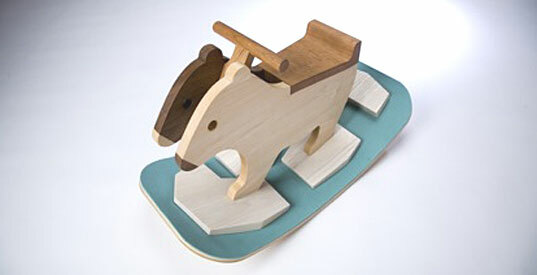 Plan Toys crafts their line from eco-friendly rubber wood from trees no longer able to produce latex, using non-formaldehyde E-Zero glue and safe, non-toxic water-based dyes. For a more authentic riding experience, invite your kid to hop on a real saddle on the Giddyup Rocking Stool. Designer Tim Wigmore tops sustainably grown wooden bases with reclaimed leather saddles that are too worn for riders to safely use atop horses. He makes them look polished and beautiful again, but you’ll still see the natural scuffs and scratches that give fuel to the history behind this unique rocking toy. As artful as it is playful, Japanese designer Masahiro Minami created the Bears on Melting Ice rocker for his daughter after learning about Pizzly Bears — the unlikely offspring of Grizzly bears and Polar Bears (yes, they’re real!) whose habitats collided due to melting snow caps. An environmental conundrum, yes, but also a sweet inspiration for a well-designed rocker. If you’re short on space or simply not a fan of letting big toys clutter your home, Plan Toys’ Tori Rocking Horse is a great option because it folds flat for storage. Like other playthings from the eco-conscious company, this rocker is made from sustainable rubber wood that no longer produces latex. If not used for toy making, it would end up being burned into charcoal. 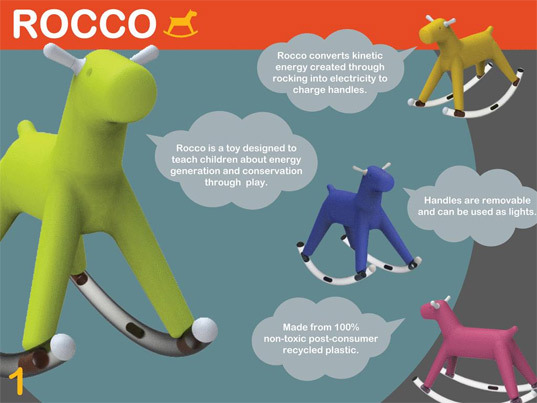 An entry in the 2010 Greener Gadgets Competition, Rocco is green in more ways than one. 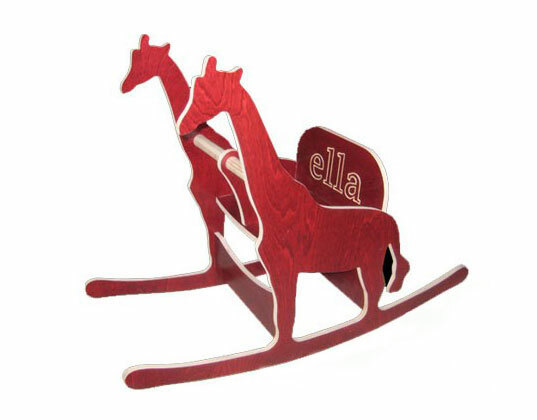 First, the rocking horse is made from 100% post consumer recycled plastic. And, for a second fun eco twist, the toy transforms the kinetic energy from your child’s rocking action into electricity that charges LED lights inside the handles. You can keep them in place as the horse’s ears or remove them to use as flashlights or nightlights around the house. Offi Baltic Rocking Horse Chair Rocking chair meets rocking horse in this best-of-both-worlds design from modern furniture maker Offi. The Baltic Rocking Horse Chair is made from Forest Stewardship Council-certified birch ply and the tried-and-true design has been in production for more than half a century in Europe. Recycle Studio Giraffe Rocking Chair Step out of the rocking horse box and go for a handcrafted Giraffe Rocking Chair to spark your little one's imagination. Recycle Studio uses over 90% recycled materials including plywood leftover from making daycare furniture. For no additional cost you can personalize this rocker with your child's name. Plan Toys Walking Elephant Another animal rocker inspired by an African safari, this Walking Elephant from Plan Toys provides a unique riding motion. Powered by your child's movement of rocking back and forth, the toy impressively walks forward. Plan Toys crafts their line from eco-friendly rubber wood from trees no longer able to produce latex, using non-formaldehyde E-Zero glue and safe, non-toxic water-based dyes. 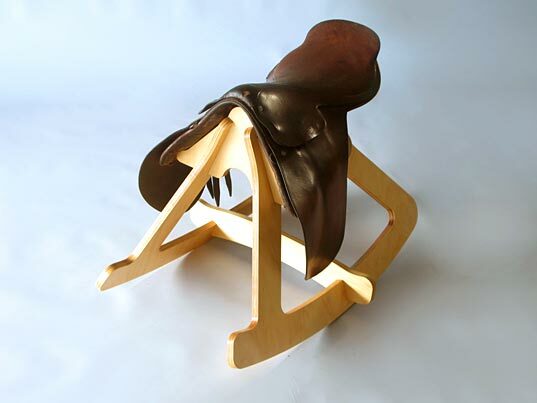 Tim Wigmore Giddyup Rocking Stool For a more authentic riding experience, invite your kid to hop on a real saddle on the Giddyup Rocking Stool. Designer Tim Wigmore tops sustainably grown wooden bases with reclaimed leather saddles that are too worn for riders to safely use atop horses. He makes them look polished and beautiful again, but you'll still see the natural scuffs and scratches that give fuel to the history behind this unique rocking toy. Masahiro Minami Bears on Melting Ice As artful as it is playful, Japanese designer Masahiro Minami created the Bears on Melting Ice rocker for his daughter after learning about Pizzly Bears -- the unlikely offspring of Grizzly bears and Polar Bears (yes, they're real!) whose habitats collided due to melting snow caps. An environmental conundrum, yes, but also a sweet inspiration for a well-designed rocker. 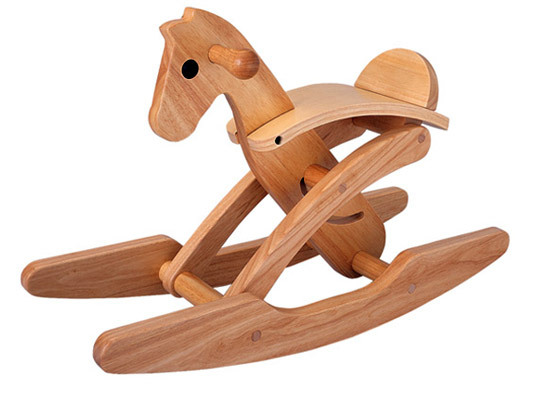 Plan Toys Tori Rocking Horse If you're short on space or simply not a fan of letting big toys clutter your home, Plan Toys' Tori Rocking Horse is a great option because it folds flat for storage. Like other playthings from the eco-conscious company, this rocker is made from sustainable rubber wood that no longer produces latex. If not used for toy making, it would end up being burned into charcoal. Rocco An entry in the 2010 Greener Gadgets Competition, Rocco is green in more ways than one. 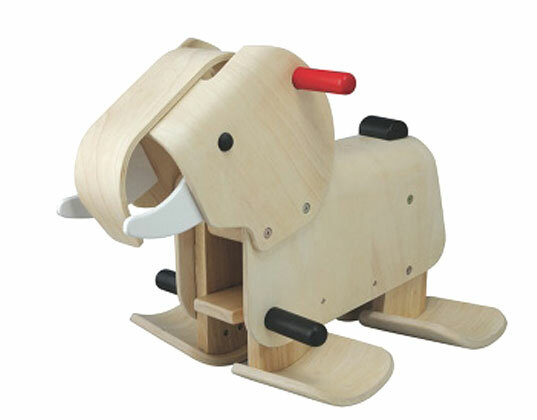 First, the rocking horse is made from 100% post consumer recycled plastic. And, for a second fun eco twist, the toy transforms the kinetic energy from your child's rocking action into electricity that charges LED lights inside the handles. You can keep them in place as the horse's ears or remove them to use as flashlights or nightlights around the house.